Donal Dorr talks here about the importance and current significance of the document “Justice in the World” that was issued by the Synod of bishops forty years ago. 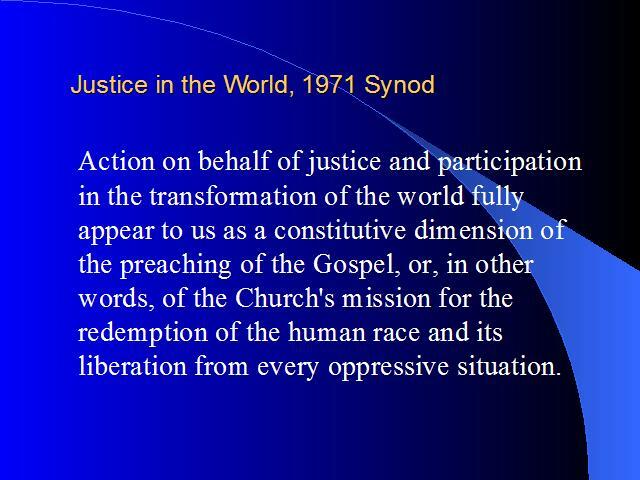 In celebration of the 40th anniversary of the publication of the 1971 Synod document, ‘Justice in the World’, the JPIC Commission in Rome is conducting a series of interviews with people from around the world who have something constructive and educational to say about this document. The videos, which are then placed on YouTube, are designed to further the incorporation of Catholic Social Teaching into the mainstream of Catholic life. The Synod Document is available in eight languages: English, French, Spanish, Italian, German, Polish, Indonesian and Korean on the USG/USIG JPIC website.